When Spanish horror icon Paul Naschy died on November 30, 2009, at the age of 75, he left behind a legacy of dozens of horror films in which he played all kinds of monsters and heroes — as well as monstrous heroes in the case of the long-running Waldemar Daninsky series. Of the eleven films that are extant (the twelfth, 1968’s Las Noches del Hombre Lobo, was apparently never completed), only a handful have received proper Region 1 releases. That means collectors who want to revel in all of Waldemar’s misadventures have to rely on somewhat more dubious sources to get their fix. That’s certainly the case with 1970’s Los Monstruos del Terror, which is more commonly known as Assignment Terror. Even though it was intended to be the third film in the series, Naschy is actually sixth-billed in Assignment Terror, but that may be because Waldemar is but one of four monsters in the film, the main plot of which is about aliens from a dying world who occupy the bodies of dead human scientists so they can carry out their plan to kill off all of Earth’s inhabitants. This they do by reviving a dead vampire whose skeleton has been put on display in a carnival sideshow, a werewolf that has been resting peacefully in his family crypt, a mummy whose tomb has heretofore been undisturbed, and Frankenstein’s monster, which was apparently just lying around somewhere. Heading up the mission, incidentally, is Michael Rennie, who watches everything over closed-circuit TV and dispassionately dishes out punishments to his subordinates whenever they mess things up, which is often enough. Even second-billed Karin Dor is subject to his wrath after she lets Naschy escape for reasons that are never made clear. This time out Naschy has added another wrinkle to the mythology since a werewolf’s killer must not only be a woman who loves him, but she must also be willing to die with him. Alas, we only get to see him transform twice, but Naschy makes the last one count since he gets to play his hairy alter ego for the last 15 minutes of the film. Naschy wolfs out a few more times in the next film in the series, 1970’s La Furia del Hombre Lobo or The Fury of the Wolfman. This entry turns Waldemar into a professor who is the sole survivor of an expedition to Tibet where he was attacked by a yeti. (He would return there for a rematch in 1975’s The Werewolf and the Yeti, but this time out their fight is left to our imagination.) Believing he has been cursed, Naschy is obviously in the perfect frame of mind to find out that his wife (Pilar Zorrilla) is cheating on him and her lover (Fabián Conde) has tampered with the brakes of his car, causing him to get into what they hope will be a fatal accident. It isn’t, though, and when Naschy reveals his condition to a colleague (Perla Cristal) who used to be his lover, she who wastes no time in making him part of her brain-control experiments. First Naschy eliminates his wife and her lover, then he attacks some random people we’ve never met before, which baffles both the audience and the police. Even more baffling, though, is the way director José María Zabalza intercuts shots of Naschy wandering around like he’s just out for a stroll (or perhaps waiting to catch a bus) with more energetic scenes from Frankenstein’s Bloody Terror which do not match at all. Eventually the action shifts to Wolfstein Castle, where Cristal is holding Naschy captive, and where she keeps her failed experiments locked up in the dungeon. All Naschy has to do is wait for the next full moon, though, and he’ll make sure the mad scientist gets hers. Mad science is afoot in 1972’s Dr. Jekyll y el Hombre Lobo as well, but I previously dealt with that in the Full Moon Feature about Other Werewolves on London. 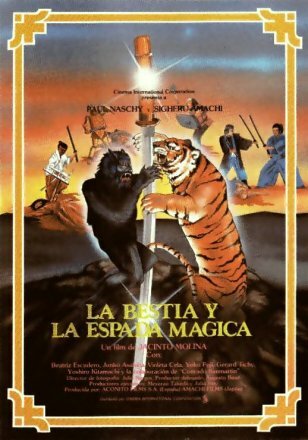 And skipping ahead, I’ll also have to skip over 1983’s Le Bestia y la Espada Mágica or The Beast and the Magic Sword, which plops Waldemar Daninksy down in the 16th century and finds him traveling to Japan in search of a cure for his lycanthropy, since that film continues to elude me. As time has shown again and again, though, you can’t keep a good werewolf down, so lucky thirteen years later he was brought back to be the title character in 1996’s Spanish-made Licántropo, which gives him yet another origin story. As far as Waldemar is concerned, he’s merely suffering from periodic chest pains and nightmares, which his comely doctor (Amparo Muñoz) assures him will go away as soon as he stops overworking himself, a view echoed by his lawyer wife (Rosa Fontana). There’s little chance of that happening, though, when a rash of brutal murders breaks out, stumping police inspector Antonio Pica and his green-around-the-gills assistant (Jesús Calle), whose animal attack theory isn’t given much credence. The same goes for pathologist José María Caffarel’s theory that the weapon used in the killings is a weeding hoe, particularly since that doesn’t account for the chunks of flesh missing from the first victim. Meanwhile, there’s a subplot involving Waldemar’s teenage daughter (Eva Isanta), whose friendship with horror aficionado Jorge R. Lucas is not looked kindly upon by his father, pessimistic priest Luis Maluenda. Then there’s the ghost of gypsy chief Javier Loyola, who appears to Waldemar to warn him about his curse and later to Muñoz when she begins reading up on lycanthropy. Disappointingly, director Francisco Rodríguez Gordillo keeps Waldemar’s furry form out of frame for far too much of the running time. In fact, el Hombre Lobo doesn’t get his first, altogether too fleeting, closeup until the film is nearly half over. (And the second one is just as brief.) Perhaps the greatest crime of all, though, is the CGI-aided transformation in the final reel, which I should have realized was a distinct possibility, but somehow I had hoped that they would have stuck with the old ways. Then again, when an actor is nearing retirement age (as Naschy was at the time of filming), they’re less apt to want to spend hours upon hours in a makeup chair. He would consent to do so again eight years later, though, in Fred Olen Ray’s Tomb of the Werewolf. That’s another one that has escaped my attention, but not because it’s impossible to track down. Rather, it’s because life is way too short to spend any of it watching Fred Olen Ray movies.